Does your application have compliance requirements to retain data for a long period of time? Or do you need to extend the built-in backup retention for oops recovery past 35 days? Now, with just a few clicks, you can easily enable your databases to have long-term retention. Azure SQL Database now supports backups stored in your own Azure Backup Service Vault. This allows you easily extend the built-it retention period from 35 days to up to 10 years. Now supporting your data retention requirements is much simpler. Today Azure SQL Database automatically creates a full backup every week for each of your databases. Once you add the LTR policy to a database using Azure Portal or API, these weekly backups will be automatically copied to your own Azure Backup Service Vault. If your databases are encrypted with TDE, that's no problem -- the backups are automatically encrypted at rest. The Services Vault will automatically delete your expired backups based on their timestamp, so there's no need to to manage the backup schedule or worry about the cleanup of the old files. The following diagram shows how to add LTR policy in the Portal. 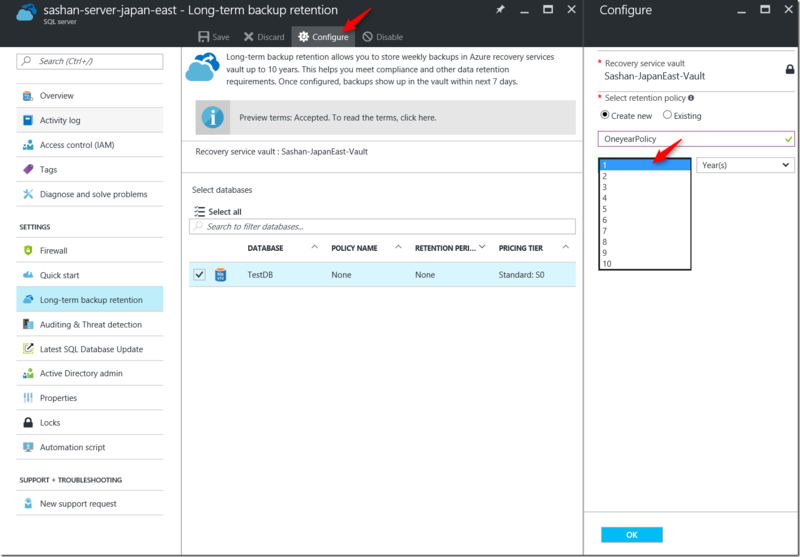 Get started with the Azure SQL Database long-term backup retention preview by simply selecting Azure Backup Service Vault for your SQL server in the Azure Portal and creating a retention policy for your database. The database backups will show up in the vault within seven days.